The game board has 20 Ship Cards available for building: 5 bows, 10 middles, and 5 sterns. You can buy one, two, or three Ship Cards in any combination. For each Ship Card you buy, you pay the indicated number of guilders. (Those at the bottom cost nothing, those in the middle cost 1, and those in the two rows closest to the card decks cost 2). Ship Cards are used to build ships. A completed ship has a bow on the left, a stern on the right, and only middle cards in between, with no empty spaces. A completed ship must have at least 1 middle card. The new cards must be placed in empty spaces. You cannot move or re-arrange cards. The only way to make space in your Shipyard is to complete a ship. (And completed ships don't leave the yard until step 5). You cannot fill up all your empty spaces unless the result is at least one completed ship. You cannot play a card in a place that would make it impossible for it to become part of a completed ship. 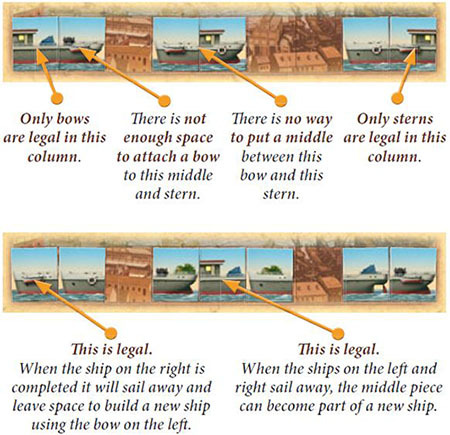 However, it is legal to add on to ships that need another ship to leave before they can be completed. 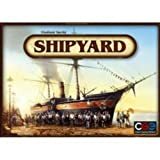 Note that you are not required to place Ship Cards so that they attach to those already in the Shipyard. It is possible to have a ship spread out across the yard in several pieces. If you complete at least one ship during this action, you will take it out on a Shakedown Cruise at the end of your turn. Tip: Not all Ship Cards are alike. The differences in the illustrations are not just for decoration. To find out the meanings of the lifebuoys, lifeboats, lanterns, cabins, and mounts, read the Shakedown Cruise chapter. After all your new Ship Cards have been placed in your Shipyard, slide the cards on the Game Board down into the empty spaces so that the only empty spaces are at the tops of the columns. Fill these in with new cards from the corresponding decks. The newest cards will be the most expensive. Note: The two columns of middles are treated separately, so that if you take 3 cards from one column, then that column will have 3 empty spaces at the top when you slide the remaining two cards down. However, both columns are re-filled from the same deck. Note: If you select this action, you must take at least one Ship Card from the Game Board. If you have no money, you must take one or more of the free Ship Cards. You can only take cards that you can legally play. If you have no legal play, you cannot choose this action. With this action, you buy one of the 5 available Freight Trains. You pay the indicated number of guilders. (The card at the bottom of the column is free). Slide cards down the column into the vacated space, and deal a new card into the resulting empty space at the top. (So the newest card is the most expensive). If you run out of cards, shuffle the used cards together and make a new deck. Tip: Your Freight Train can be traded in at the Commodities Exchange for guilders, Equipment, or Crew. Th is is a separate action, explained below. With this action, you buy one of the 5 available Shipping Canals. You pay the indicated number of guilders and place the Canal card in front of you in such a way that it extends your existing canal system. Then you slide the remaining Canals down the column and deal a new one into the resulting empty space at the top. If you run out of Canals, collect the used Canals (after making a note of how many each player has) and shuffle them together to make a new deck. If this is your first Canal, you place your ship figure on one of the spaces along the edge with its stern pointing out of the Canal (as though it just sailed in). This is where your first Shakedown Cruise will start. Each new Canal is attached so that at least one side matches up with the other cards in the canal system. You cannot re-arrange your Ca- nals, nor can you move or rotate the ship figure. Canals are used to earn points for your ships during the Shake- down Cruise. Read that chapter to find out what the symbols mean. Tip: It is important to choose Canals that match up well with the ships you are building. With this action, you choose one piece of Equipment. First move the Manufacture Equipment marker one space clockwise around the brown ring. The marker indicates the piece of Equipment that you can get for free. If you want a different piece of Equipment, move the marker clockwise around the ring, paying 1 guilder for each move. (So a different piece will cost 1, 2, or 3, and the most expensive piece is the one the figure started on). Take the piece from the bank. Equipment is stored in your Shipyard. It can be attached to any completed ship when the ship is ready for its Shakedown Cruise. Once it leaves the Shipyard, the Equipment will be attached to that ship for the remainder of the game. Tip: Equipment needs a mounting point. It is important to choose Ship Cards and Equipment that match each other. Recruit Crew is analogous to Manufacture Equipment except the marker moves clockwise around the spaces of the green circle. Three of the spaces allow you to choose Crew, while the fourth space allows you to take a propeller. Tip: As explained in the Introduction, every ship needs a captain. Be sure you have at least one captain in your Shipyard before you complete a ship. Without a captain, that ship will earn you no points. Every Crew Member besides the captain needs a cabin. If you are planning to have extra Crew on your ship, be sure to choose Ship Cards with cabins. With this action, you get one Employee Card. Employees allow you to manufacture extra Equipment, recruit more Crew, place more Crew or Equipment on your ships, or get better bargains. You start by moving the marker ahead one space clockwise on the Employee Track (the red oval). As with Recruit Crew or Manufacture Equipment, you can pay guilders to move the marker extra spaces around the track (one guilder per extra space) until you have the marker on the space you want. Each space corresponds to three Employees. Take the one you want. Note: Some Employees have surcharges: if you take an Engineer (brown card) or a Recruiter (green card), you must pay 1 extra guilder. You cannot take an Employee that is exactly the same as one you already have. (So it is legal to have two Recruiters, for example, but only if they do different things). Your Employees are kept face up in front of you. They will work for you until the end of the game, bringing you the advantages. With this action you trade in one Freight Train Card. For each commodity on the train, you decide whether to sell it for guilders or exchange it for Equipment or Crew. If you have no Freight Train cards, you cannot choose this action. You begin the action by moving the marker one space clockwise around the Exchange hexagon. This determines the current commodity prices. (You cannot pay to move the marker extra spaces). Choose which Freight Train you are exchanging. For each car on the train, you can either sell its cargo for the amount of guilders indicated by the marker, or trade its cargo for one of the items depicted in the table in the center of the hexagon. You do not have to do the same thing with each train car. On the contrary, you cannot choose to exchange two train cars for the same piece of Equipment or Crew. For example, if you have two loads of coal, you can exchange one for a propeller and one for a smokestack, but you can't exchange both for two smokestacks. However, you can choose to sell one or both loads for guilders. Tip: One of the keys to success is understanding when to manufacture or recruit, and when to seek Equipment or Crew at the Exchange. This action is only available in a four-player game. When you perform this action, you gain 2 guilders from the bank.